I took a trip down to Newport Beach, CA. 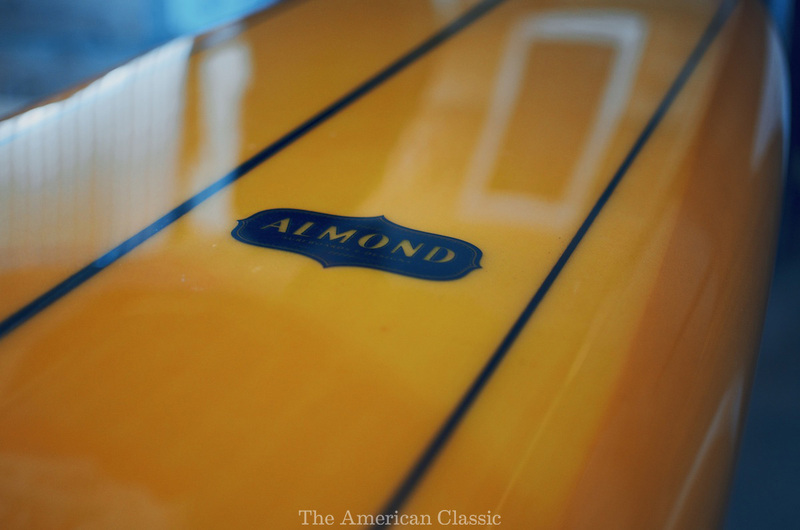 to visit Almond Surfboards, nestled on the north side of Newport Bay. Moving to California has provided me with the insight that whether or not you surf, you know someone here who does and by proxy you’ll become extremely familiar with a host of brands and their product lineups that you never even knew existed before. I can’t remember specifically where or when I had heard of these guys but was thrilled when their email popped up in my inbox. The shop itself is a beautiful space, reflecting the hard work and perseverance of a brand founded by a few young guys with a dream. Everything had a story, from the way products were displayed to the designs on the t-shirts and the art on the walls. Nothing was thrown up without care or a reason which is impressive; I’ve visited plenty of shops (most of which never made it on this site) where trinkets and props make up the majority of the space and nothing holds true value for the customer rather than the limited, precious items they have for sale. Not only does Almond maximize the small space they’re working with to display their famed surfboards perfectly but their retail display of men’s clothing shares the stage wonderfully. 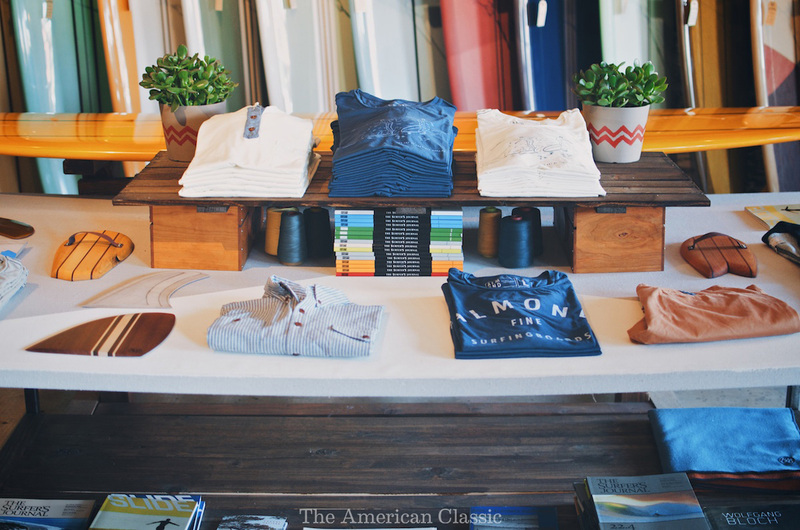 Even being a non-surfer, visiting this shop is completely worth it for any guy looking for some California inspired wear without feeling like a beach rat. 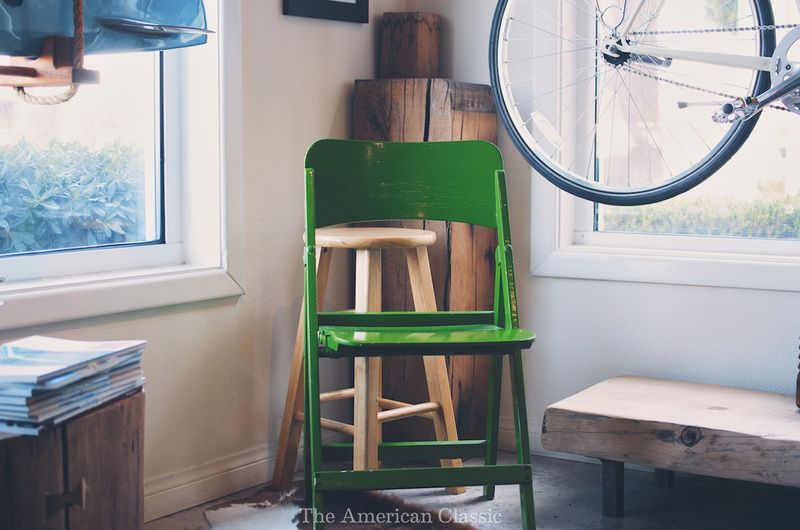 Click here to view the rest of the article and photos. Don’t get me wrong, there’s plenty of surf-inspired wares here. 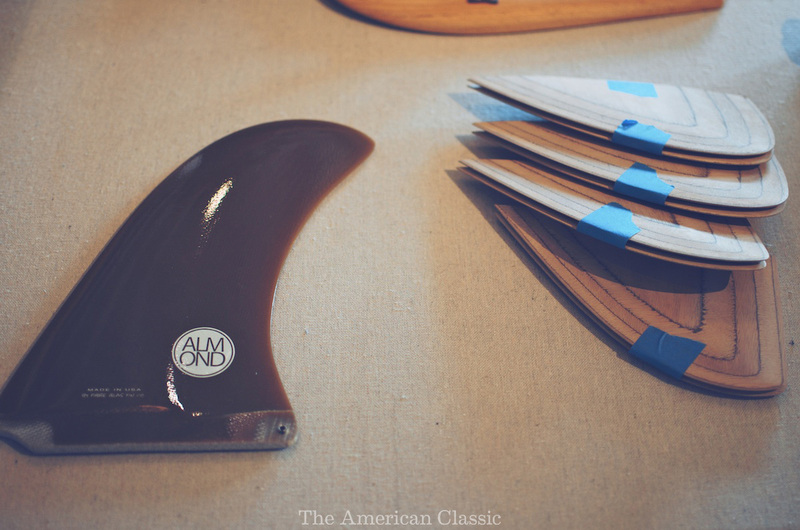 Most of their stuff appeals directly to the crowd that both surfs and appreciates fine craftsmanship. Hence their label of “Surfer + Craftsman”. There’s plenty of stuff here such as the “Rad Cars” tee (vehicle stacked high with surfboards) or the “Tech Specs” tee (early surfboard blueprints) that scream surf. 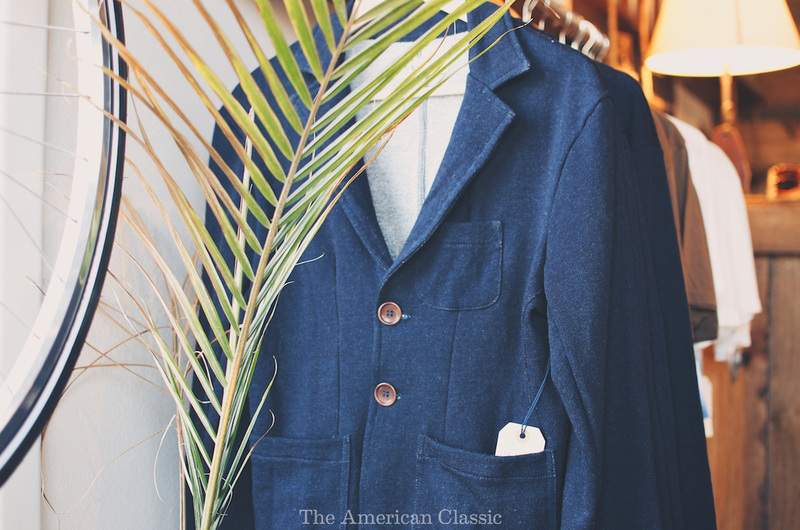 These shirts somehow fit perfectly in a room with their “Icon Blazer” (which I picked up while I was there; some pictures in this article) which is raw indigo dyed French Terry. 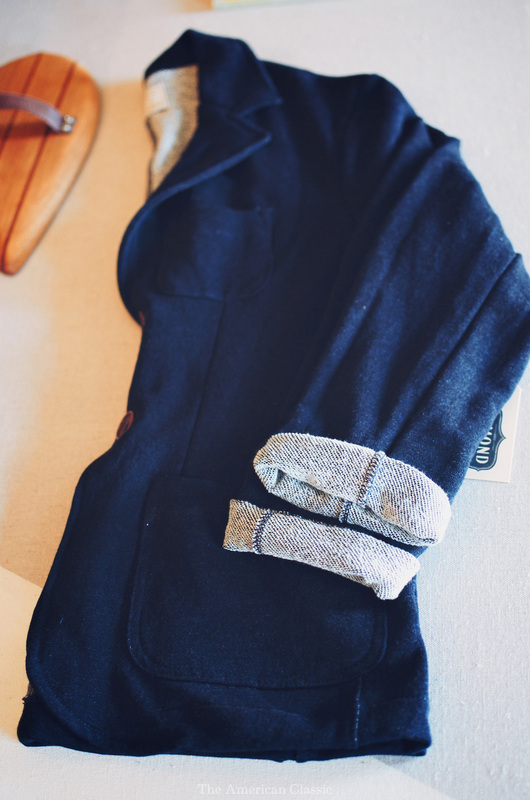 It’s basically a trim blazer you could wear out to a nice restaurant or to the office and it just so happens to be made out of super-fine sweatshirt material. The blazer is super cozy, plus it’s dyed with indigo which means someday after plenty of wears, this thing will take on a life of it’s own. 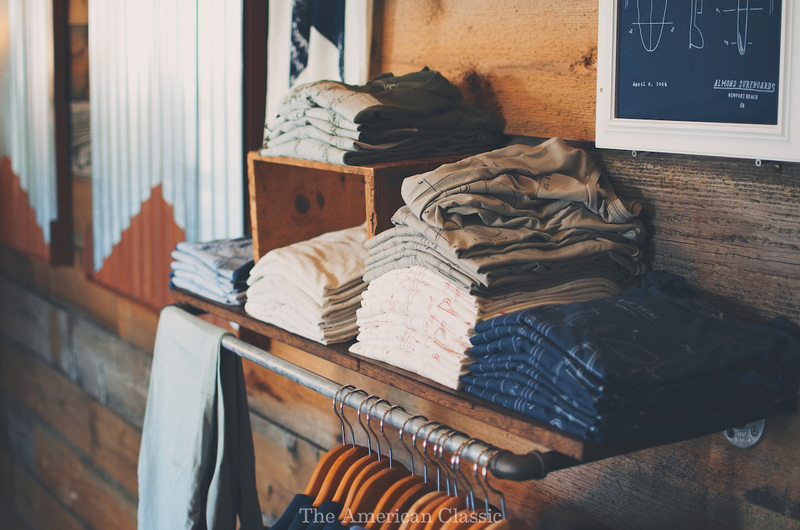 They also carry a beautiful henley trimmed with chambray for the colder months that comes in blue and white (and it’s got a damn pocket; it’s okay to start throwing your wallet at the screen). 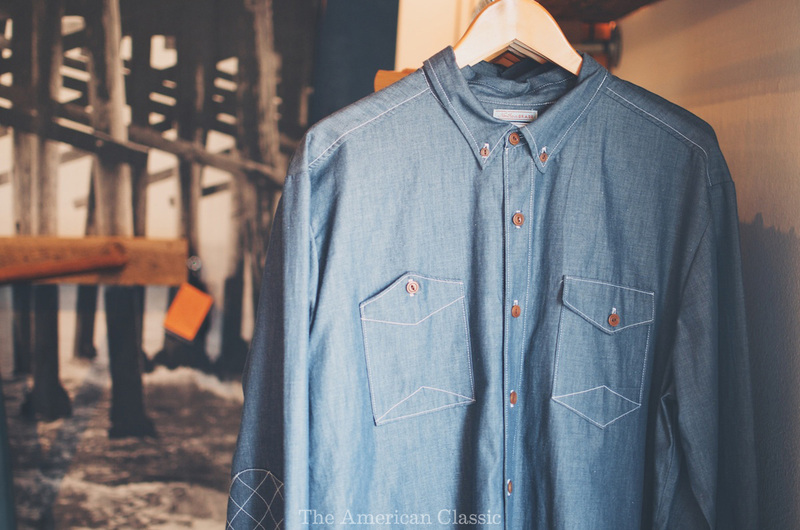 Recently they showed at Northern Grade as it passed through LA and designed a collaborative shirt with Mac and Katherine (founders of the show) featuring some lightweight chambray, great workwear detailing on the elbows and pockets, and plenty of Almond styling all over. 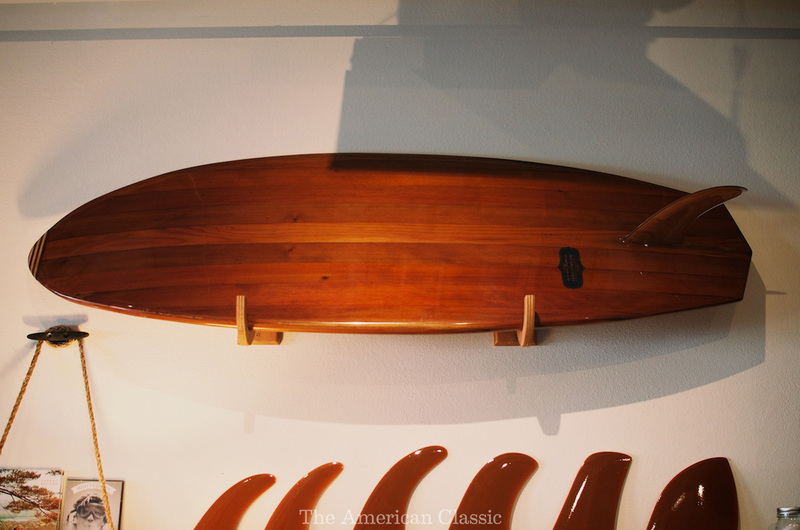 The surfboards that Almond crafts are absolutely beautiful. They work with a shaper just up the coast to perfect their designs and deliver the custom pieces; almost every board turns out this way. As pictured here, there’s a host of options you can choose from ranging from tail style to color scheme and beyond. 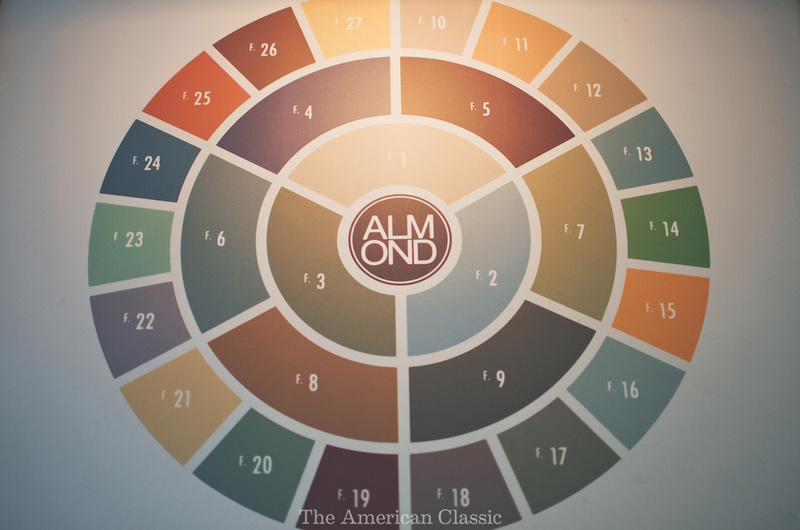 Plenty of folks design their own but Almond has some pretty excellent starting points for the mildly uninspired, as listed on the signs hanging in their shop and on the boards propped up against the wall. There were some really cool patterns and inlays that are difficult to capture on camera, but one of my favorites was a yellow long board laid out behind one of their retail tables (pictured in this article). There was something about the particular shade of yellow that really got me. 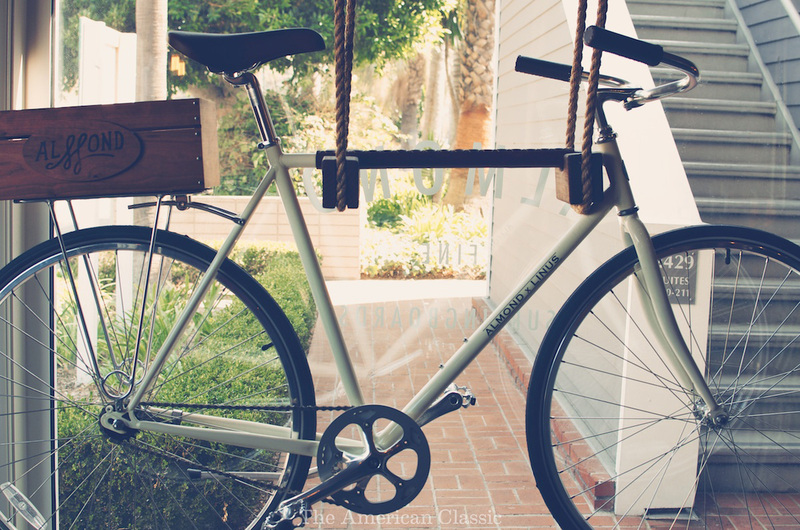 Tell me a bit about the history of Almond and how the brand came to be. Dave Allee (founder) began shaping boards for himself and his friends while forming the brand concept for Almond while still in college. Dave began Almond out of a desire to create something different and meet a need in the market for a lifestyle brand that wasn’t there at the time. When Dave met Griffin Neumann-Kyle in 2008 it really set the stage for Almond to be able to grow because Griffin was looking to shape all day every day. Once Griffin and Dave started working together things really started to click. 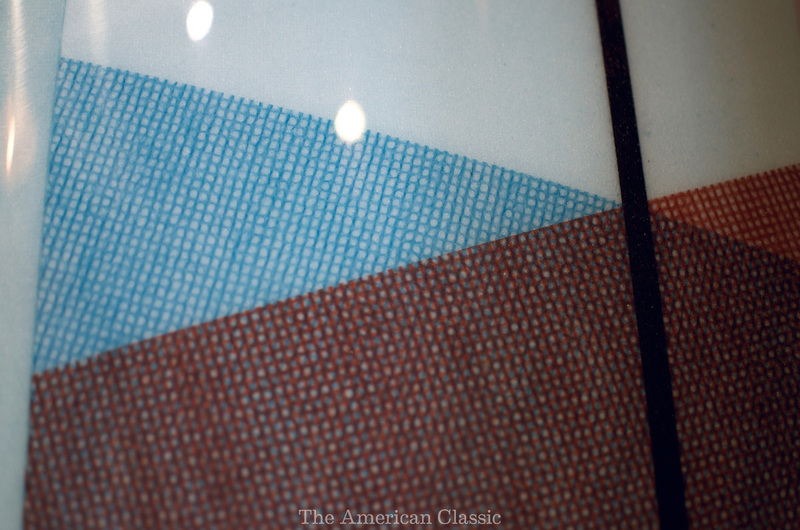 Almond’s goal is to make timeless boards and apparel. 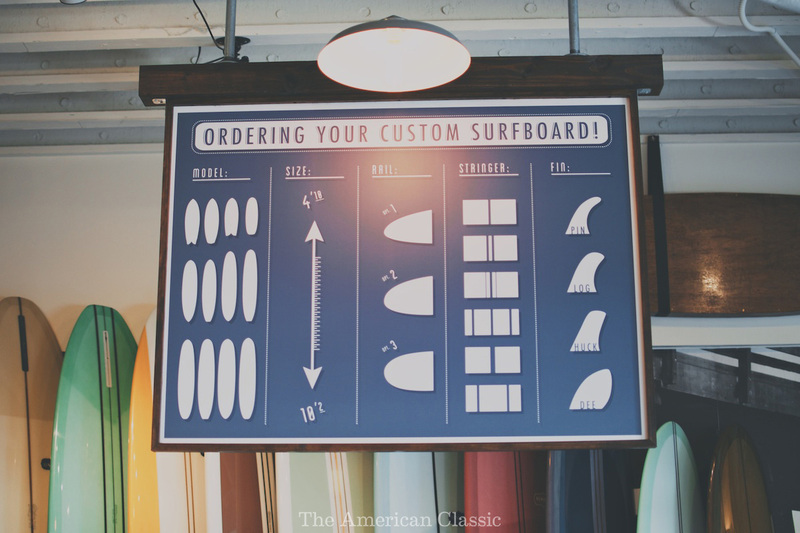 It began as a desire to make quality and classic surfboards that stand the test of time. 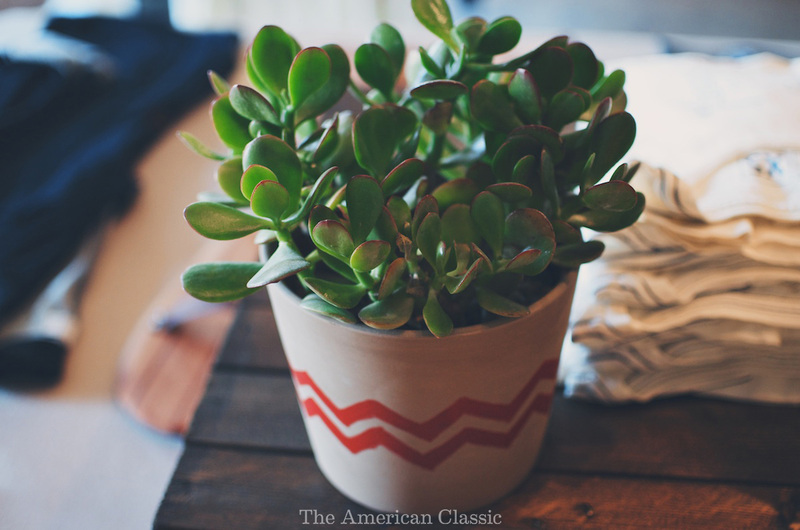 It’s always been a collaborative effort of friends trying to make things together and grow organically. What’s your approach to balancing surfboards with clothing and other goods? Our boards are all hand shaped custom pieces. We are committed to keeping it that way and limiting the number made so the apparel helps grow our brand and continue the story that the boards have started. 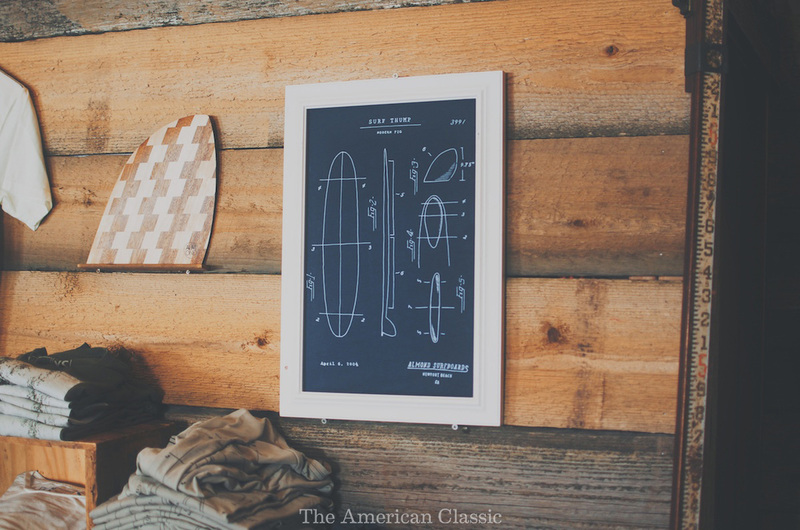 Everything draws inspiration from our surfboards and the lifestyle we are living. 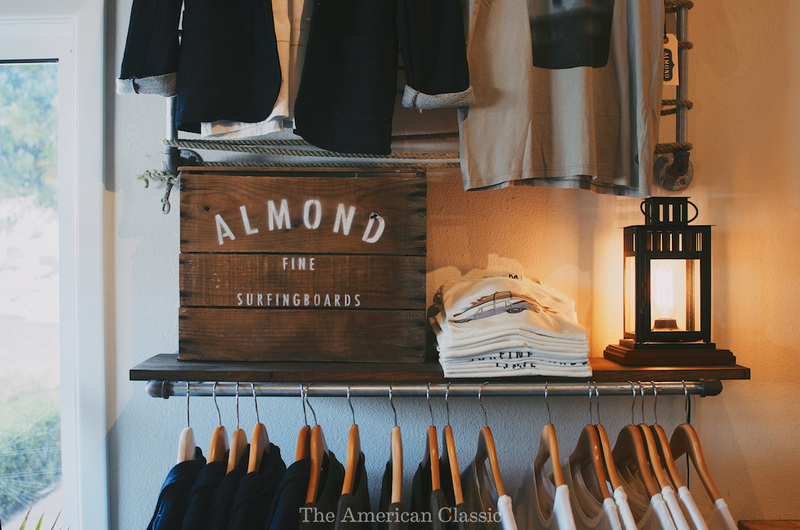 Almond has, from the beginning, made a range of products that help round out this lifestyle- including wetsuits, hand planes, tee shirts and board shorts. When I (Chad) came on board we “launched” the menswear portion of Almond. We did a lot of looking to what we had already been doing- refining it, adding new product categories, and overall trying to take it to the next level. We make everything here in California and are trying to create apparel that is timeless, not trying to chase trends, and overall trying to work with good people. As an endeavor going on a few years now, what are some entrepreneurial lessons you guys have taken away from the brand? There are only a few of us so we all have to pitch in and do everything. We all have to get up everyday and make it happen or else it won’t get done. We have hang up any egos and work together to make the dream a reality. Another thing that we have all learned is to just keep doing what we do well, not get distracted by things out of our control, and keep trying to evolve and create the best products we can. What are some of your favorite things you guys have created, surfboards or clothing? That’s a hard one. We get new boards in every week and they are always so special. There’s usually a couple that always stand out as being really beautiful so its fun to continually see new boards come in. The apparel is really exciting for us right now because it is growing and people resonate with what we are trying to do. It’s really satisfying to see a product all the way through from a sketch, to working in LA with the manufacturers, and then to bring it to the public. 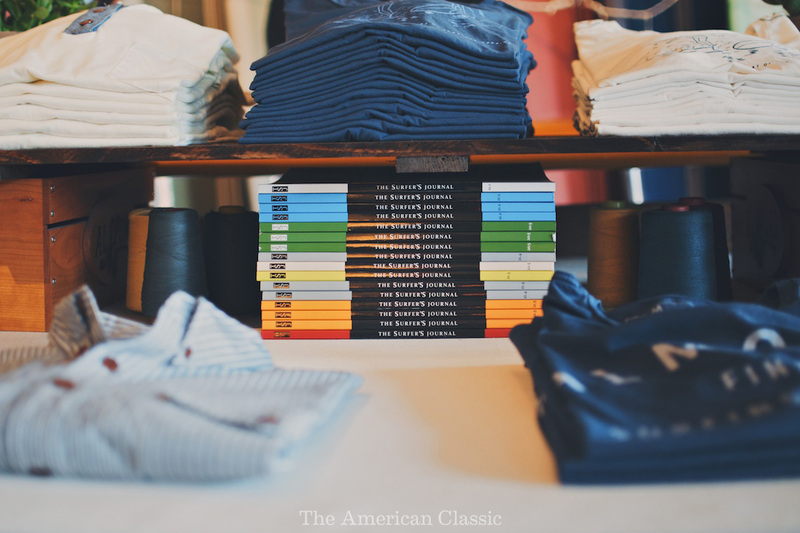 Seeing a piece like our classic stripped tee shirts, a style that we have made since the beginning of Almond, get refined and created with more attention to detail (from labels, colors, washes, etc.) is fun. 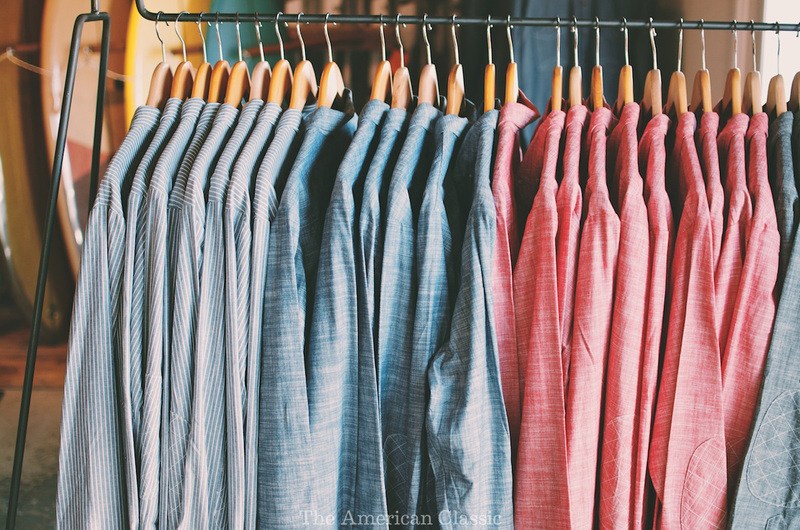 Also, bringing in more traditional menswear pieces and putting our Almond touch on it is nice. Our Icon Blazer for example is a slim fitting blazer, but we made it out of denim French terry that will wear like a pair of jeans over time. It looks really sharp, but is as comfortable as a hoodie. It is a throwback to when surf travel required a blazer as much as it did trunks and a board. It’s exciting to be a brand rooted in surfboards that is making non-traditional surf wear. It’s stuff that anyone can wear. We are going to just keep trying to grow the apparel- update fabrications, color, add some styles and just keep being Almond. Continue to make the best surfboards we can. We are also working on a Women’s line that we are really excited about. 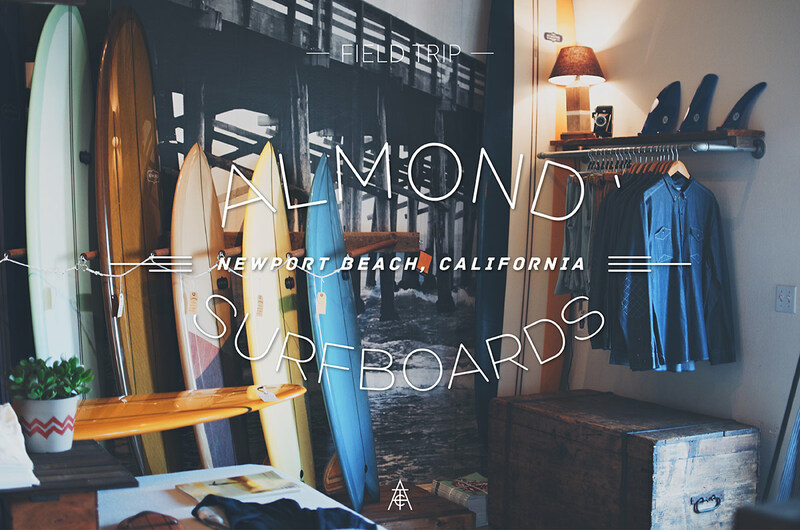 Almond Surfboards is located at 2429 West Coast Highway Newport Beach, CA. 92663. They’re open Monday through Saturday, 10am-6pm. Closed Sundays.